Hundreds of thousands of people opposed to the UK’s withdrawal from the EU marched through central London to demand a new referendum as the deepening Brexit crisis risked sinking Prime Minister Theresa May’s premiership. 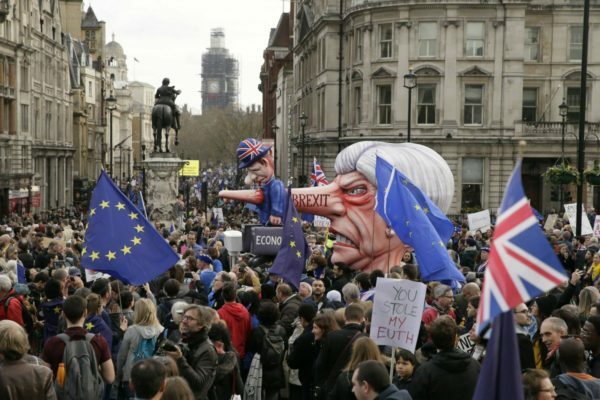 Hundreds of thousands of people opposed to the UK’s withdrawal from the EU marched through central London on Saturday to demand a new referendum as the deepening Brexit crisis risked sinking Prime Minister Theresa May’s premiership. Marchers set off in central London with banners proclaiming, “The best deal is no Brexit” and “We demand a People’s Vote” in what organisers said could be the biggest anti-Brexit protest yet. Pro-EU demonstrators gathered for a “Put it to the people march” at Marble Arch on the edge of Hyde Park around midday before marching past the prime minister’s office in Downing Street and finishing outside parliament. Organisers arranged transport and even chartered a train to bring protesters from all corners of the country to the capital. Two hundred coaches from around Britain were booked to take people to London for the march. One coach left the Scottish Highlands on Friday evening and another left from Cornwall on England’s western tip early on Saturday morning. “I am an old man and the outcome won’t affect me – but it will affect my family and many people that I know for years to come,” he said. Phoebe Poole, 18, who was holding a placard saying “Never gonna give EU up”, in reference to a song by 1980s popstar Rick Astley, wasn’t old enough to vote in the 2016 referendum. Many voters in Britain say they have become increasingly bored by Brexit and May said on Wednesday that they want this stage of the Brexit process to be “over and done with”.